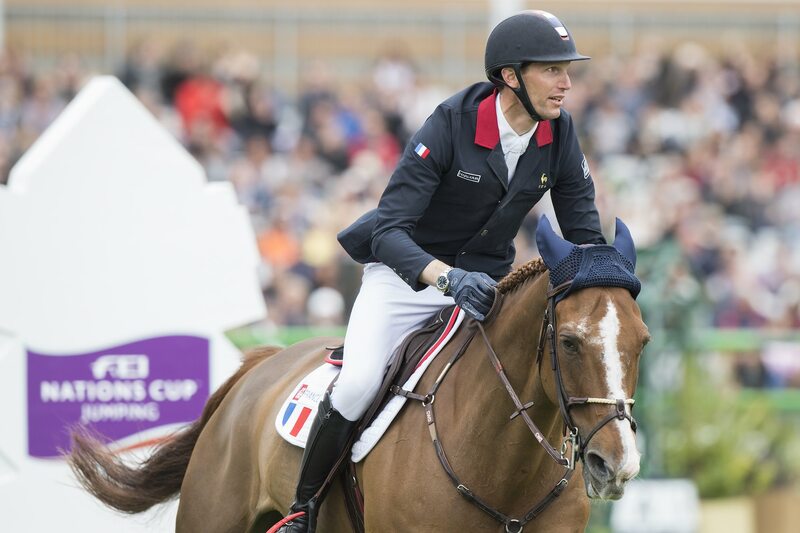 The French Olympic winning partnership of Kevin Staut and Reveur de Hurtebise HDC snatched victory from Sweden during the second leg of the FEI Nations Cup™ Jumping 2017 Europe Division 1 at La Baule over the weekend. With the same grit that saw them overcome several setbacks on the road to Olympic gold in Rio last summer, Philippe Guerdat’s side stood firm after team-member Roger Yves Bost was eliminated for a spectacular first-round fall. And when it came down to a third-round jump-off against the clock then Kevin Staut clinched it. It was always going to be a tough contest. With seven of the eight competing nations all chasing qualifying points for the series Final in Barcelona, the stakes were high. After the first round, Sweden were ahead with the only zero score, with the Division 2 side from Belgium carrying just two faults. The French were next in line with four on the board, but closely followed by Switzerland on five and Ireland on six. It went to a jump off and Kevin Staut led the way, posting a clear in 35.74 seconds despite “a lucky touch at the last”. And when Sweden’s Fredricson, individual silver medallist in Rio, hit the last two fences the home crowd erupted with excitement. France beat Sweden in a third-round jump-off against the clock. Team Belgium finished 5th, but weren't eligible for points as they are competing in Europe Division 2. 3 horse-and-rider combinations jumped double-clear: Penelope Leprevost and Flora de Mariposa from France, Shane Breen and Golden Hawk for Ireland and Paul Estermann with Lord Pepsi from Switzerland. Teams can compete in other divisions apart from their own, but don’t win points. The next leg of the Europe Division 1 series will take place at Piazza di Siena in Rome, Italy on Friday 26 May.